I have an anxiety disorder. I've mentioned it before, but try to not make a big deal out of it. It is what it is. I have therapy for this, I have meds for this. I do relaxation things - I meditate. I would practice more yoga if someone in this town would teach a yoga class for working women - something in the evening. But they don't so I don't & I do what I can on my own. That is what it is. In addition, I have for years practiced visualization "therapy". When practicing relaxation visualizations, there is usually a "safe" place you invent for yourself. You're on the beach soaking up the sun, you're on a mountain picking wildflowers, whatever. All are pretty good. However, over the years, I have found myself consistently inventing a place that is isolated, but safe. It's cold & stormy outside, but comfy inside. I have all I need. I am always alone, without people, safe in the silence, secure. But I always have Maggie with me. She is always there, while the storm rages outside. This morning, I awoke to find Maggie sick, in need of a trip to the vet. Not in terrible pain, but sick & needing attention. I also awoke to a rainstorm. Not a flood, but a substantial downpour. 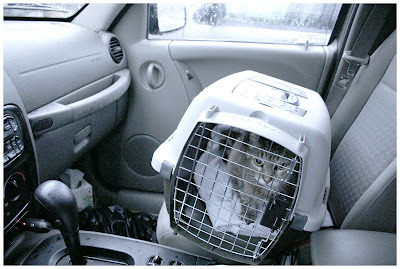 She & I managed to get into the car, she staying much drier than I in her cat carrier. We stayed in the car until the vet could work us in. My safe place. There we sat, the windshield wipers quite hypnotic, the shooosh . . . shooosh . . . shooosh against the windshield, the rain battering the car. Every so often a sad little meow from Maggie as she waited, but mostly the silence & the sound of the rain, the wipers, the hum of the Jeep (almost out of gas) trying to lull me to sleep. Maggie too. She became quiet & just watched the rain while I sipped a coke. She's been doing very well - so well, in fact that last week the vet decided we should try reducing her injections. I had a bad gut feeling about that, but convinced myself I was being silly, being paranoid, being anxious. I should know better than to distrust myself. I have a very aware belly. Too aware. But yesterday is yesterday & today is today & Maggie will be okay. Back to the daily injections + a week's worth of antibiotics. But that safe place worked. All those years of visualizing that place worked. There we sat this morning, and I felt safe, not so anxious. I knew she'd be okay. I am always alone in my safe place too...I will have to ponder why?? I'm so glad that your Maggie is going to be alright! What condition is it that she has? Being alone in your safe place...I think that is a very positive thing...a sign of your inner bravery and strength. Christy & Celeste re: the alone, safe place. I don't know if it's a sign of bravery or not. I always think of it as a sign of escape! LOL! i have never done a visualization where my car is my safe place... i know that isn't what you meant but when you described sitting there with maggie in her carrier as you waited for the vet in the rain i had a flash of memory back to december 24th 1985. we, meaning joe, myself and rachel who was 9 years old at the time were driving cross country from illinois to oregon. we were going to a brand new place far, far away to live. we were in the middle of wyoming on a 2 lane road and the snow was coming down in blankets so it was difficult to see. we were in a tiny little chevy pick-up one of those extended cab dealies that really aren't very extended...but cozy. suddenly there were about 200 sheep crossing the road in front of us bahhing and bell clanking along. fretful you know? you could hardly see them for the snow but they were shapes and we knew they were right there in front of the car. and so we sat...and sat...and sat. and it was incredibly beautiful, eerie and quiet. and we sat still right in the middle of the highway for the longest time. and i remember thinking i didn't want it to end. that there was no better or safer place to be than right there in that tiny car with the people i loved most in the world. that was a terrible time in our lives, having just come away from a tragedy in chicago that would haunt us forever. but the journey was an important experience of safety, providing us a period of time to be in that liminal place where nothing was permanent not our home or even ourselves. we were all ghosts that night. sometimes these memories come over me when i am reading a post and i feel compelled to capture them even though i am in your house and not my own. it seems to happen frequently when i am over here. i don't think you mind much though. you might even understand how that can happen and would pat me on the arm in a comforting sort of way and say, "there, there now. i don't mind much. go right ahead and use up my window space with your writing if it makes you feel better." did your car feel safe like that? Robin - Not only do I not mind, I am quite in love with your stories. This one is so wonderful. The snow in the sheep sounds too good to be true. I have a photo I've torn from a magazine laying about in my "studio space" (LOL! )- it's of sheep in a rowboat. On a lake, in the mist. It just evokes a terrific mood, as does your story. What an incredible feeling. And yes, the car felt safe like that. I read this and just had to sit here and smile. We are so alike in this way. A safe quiet place, alone, warm and cozy and comfy inside while the storms rage on outside. I conjure up this kind of imagery all the time. This is how I feel today. It's raining, and I have been so needing to feel safe and comforted these past few weeks. I have found that safe place...not only in the comfort of my home protected from the rain, but when I come here to your blog as well. And I'm so glad to hear that Maggie is doing so well...this must bring you so much comfort.